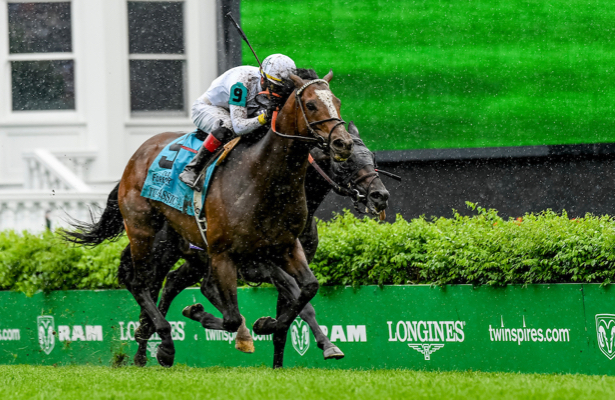 With connections planning to ship Yoshida overseas next out at the famed Royal Ascot, the 4-year-old colt on Saturday passed his final test by winning Churchill Downs’ Grade 1, $500,000 Old Forester Turf Classic. Trained by Mill Mott and ridden by Jose Ortiz, the Japanese-bred graduated to the highest level successfully — and fired off a layoff, with his last-out victory in Belmont’s Grade 3 Hill Prince in October of last year. Churchill’s turf was rated “good” for the 1 1/8-mile race and appeared significantly slower than earlier in the card. Yoshida finished in 1:54.64, hitting the lead at the top of the stretch after Shining Copper ticked off the opening half mile in 50.61 seconds. The victory came following a stretch duel with the Chad Brown-trained favorite Beach Patrol, who established early position from the outside post but ran out of steam late. Synchrony held on for third. Yoshida is under consideration for the Queen Anne Stakes on June 19 at Ascot. Deauville was a race day scratch from the Turf Classic, leaving a field of nine in the final race before the featured Kentucky Derby at Churchill Downs.